J & M Remodel created a spa-like bathroom, and a pet friendly pool deck, for a couple whose project was featured on the Animal Cribs show on cable TV’s Animal Planet channel. The couple and their chocolate Lab Turf were featured in the 2017 season. Turf goes to work with his owner Sergio at the Seattle Seahawks training facility in Renton, the Virginia Mason Athletic Center (VMAC). Turf’s job is to keep birds off of the field while Sergio attends to the condition of the Seahawks practice field. After a hard day at work, Turf is smelly and dirty, and needs a bath. The existing bathroom was cramped and not well equipped for washing a large dog. In addition, the indoor and outdoor space in the home wasn’t very dog friendly, nor was the yard conducive to having neighbors over for backyard gatherings. Enter the Animal Cribs crew. 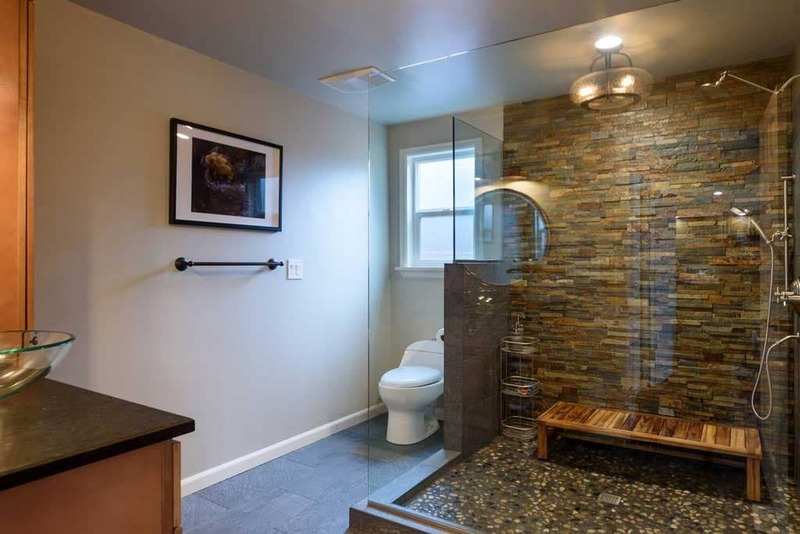 J & M remodel was contacted by Animal Cribs with the agreement of the homeowners to oversee the implementation of the design in order to address the requirements for the spa-like bathroom, laundry room relocation, and the outdoor deck aspects of the project. As a result, Turf now enjoys a larger shower where his owners can bathe him more easily, and the backyard now features a deck area for relaxing after work with neighbor friends and their dogs. The full episode of Animal Cribs on Animal Planet that features J & M Remodel can be viewed here. The first J & M employee can be seen at around the 9:50 point of the episode. Construction of the new shower starts at the 13:50 point. J & M can also be seen at the 19:38 point, and the deck and pool materials arrive at 31:05. The final results are shown to the customers at the 33:09 point, with the Bathroom at 35:16, and the deck and back yard at 36:29. As you’ll hear in the customer’s reactions during the reveal portion of the show, they are very happy with their new bathroom and deck. Sergio also left a review about this project on Houzz that you can read here.